Bridge the Gap. With the GTX 1070 Ti, Nvidia brings out a lower-priced alternative to the GTX 1080 and, in the process, forgoes the more expensive GDDR5X video memory. In the review, the Founders Edition card shall show how well it stacks up against the in-house competition. When compared to the older GeForce GTX 1070, the new "titanium" offers 27% more shader units (2432 versus 1920) with the same clock rate. With 2560 shader units and the fast GDDR5X memory, the GTX 1080 still remains in the lead. While benchmarking the “Witcher 3”, the Founders Edition card ran with the core clock of 1810 MHz, which is well above the specified boost clock of 1683 MHz. Our test system is comprised of a Core i7-4790K (not overclocked), 16 GB of DDR3 memory, Asus Z97-Deluxe motherboard, Asus PB287Q 4K monitor, Philips 328P6VJEB 4K monitor, Intel SSD 530 (system), Windows 10 64-Bit. In the synthetic benchmarks from Futuremark, the GTX 1070 Ti finds its place in between the GTX 1070 and the GTX 1080. With the OC BIOS, the slightly overclocked MSI Gaming Z GTX 1070 can keep up with the GTX 1070 Ti rather well. In our selection of gaming benchmarks, the GTX 1070 Ti positions itself in between the GTX 1070 and the GTX 1080 (both are Founders Edition cards). Therefore, the card offers enough performance to run all the games at Full HD or WQHD resolution with high details. And it can also run many games in 4K. In terms of computing performance, in the LuxMark benchmark, the GTX 1080 could not, to our great surprise, keep up with the GTX 1070 Ti and was actually beaten by the GTX 1070. In ComputeMark, the GTX 1070 Ti finds its place in between the GTX 1070 and the GTX 1080. The 3DMark Time Spy stress test yielded a very good result of 98.4% - which amounts to a 1.6% deviation during the benchmark runs. Therefore, under usual gaming load, the performance can be maintained continuously. As usual (for the Founders Edition cards), the fans remained comfortably quiet. As the high TDP might suggest, under load, the power consumption is closer to the GTX 1080 than the GTX 1070. In the FurMark stress test, the card appears to be limited artificially (there is also a warning in the reviewer’s guide). For instance, the normal GTX 1070 achieves 17% more frames per second than the Ti while keeping its energy consumption 50 watts lower. With the GeForce GTX 1070 Ti, Nvidia bridges the gap between the GTX 1070 and the GTX 1080 and offers an alternative for the currently unavailable Radeon Vega 56. In terms of efficiency, the GTX 1070 Ti is closer to the GTX 1080 than the GTX 1070. Because third party cards can only be overclocked via software or manually, the Founders Edition card does not suffer from any performance disadvantages. 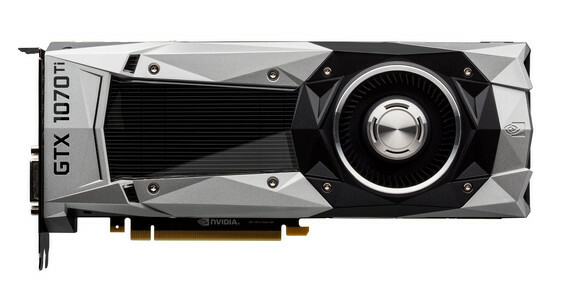 However, the cards from Nvidia’s board partners are a bit more efficient and somewhat quieter. The MSRP of 469 Euros (~$549) in Germany can be attributed to the high prices of the Vega 56 GPUs, which are being sold well above the MSRP (thanks to mining). 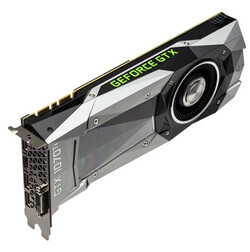 All in all, one can say that the GeForce GTX 1070 Ti Founders Edition is a well-made desktop graphics card, that is especially suited for gaming at 1440p.